The 200 West Highland Condominium on Seattle’s Queen Anne’s South slope reports that they’ve sold six homes since coming back on the market in November. Just 11 of the luxury condo homes remain. Matrix is ready to close out the Trace North development on Capitol Hill with just 15 homes left! There’s a good mix of studio (1) , open one-bedroom (6), one-bedroom (3) and two-bedroom homes (5) available. Additionally, prices were just reduced and homes now start at $209,950 and go up to $414,950. The Hjarta Condominium in Ballard reported they sold another 5 homes during the holidays and have revised prices with homes now starting from $259,950. The building is LEED Silver Certified and FHA approved. 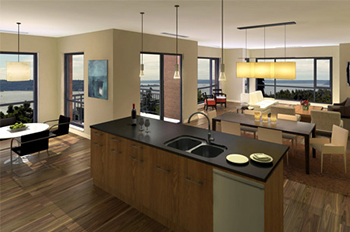 Mercer Island’s 7800 Plaza Condominium is 50% sold and prices have reduced since our last posting. This is a rare opportunity to own a new condo on Mercer Island. Disclaimer: Hjarta and 7800 Plaza condos are advertisers of The Seattle Condo Blog.